Take A Breath. Relax, You’ve Got This. Breath is life. You need to breathe in order to live. It is fundamental in generating energy in your metabolism. 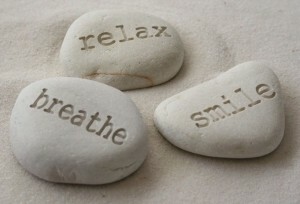 Breath is also awareness; it is a way to consciously control your physical and psychological wellbeing. Breath is a physical function that you do both unconsciously and consciously. Namely, it is controllable. So what benefit would you reap from controlling your breath? When you are in a stressful situation, your body reacts in a negative manner. This can be in the form of muscles tightening, jaw clenching, blood pressure rising, and pulse quickening. If sustained over time, this is unhealthy and can have lasting ill-effects on your body. According to WebMD, “The human body is designed to experience stress and react to it. Stress can be positive, keeping us alert and ready to avoid danger. Stress becomes negative when a person faces continuous challenges without relief or relaxation between challenges. As a result, the person becomes overworked and stress-related tension builds. Stress is a normal part of life. You cannot completely get rid of it; however you can learn to control how you respond to it. How you may ask? One quick way to try to reduce stress is through your breath. By breathing mindfully and methodically you will be able to quickly alleviate most, if not all, of the physical symptoms brought on by your stress reaction. Sit in a chair with your feet flat on the floor or on the floor with your legs comfortably crossed. Lift your body (or core) as if you were reaching to the ceiling with the crown of your head. As you relax into this erect posture, feel your heart center facing upward and outward. Namely, you’re not all hunched over and caving in at your stomach. Lay your palms gently on your knees. They can be facing upward or downward, whatever is most comfortable for you. To the count of 5, breathe in. Pause for 2. Breathe out to the count of 5. As you do this, focus on the numbers you are counting and try to feel whether your breath is in your chest or belly. After five repetitions, remove the pause and focus on saying to yourself, “Inhale, Exhale” while looping your breath in and out. With each complete in/out breath, try to expand the belly even further; breathing deeply. Your mind may wander to various thoughts and when it does, bring it back to ‘inhale, exhale’ to remain focused. Once you’ve completed about 10 breath repetitions (about 5 minutes or so), float your eyes open and take stock of how you feel. By being so focused on your breathing your body and mind have most likely responded by calming down. A Word of Caution: Do not try this when driving your car. Experiencing stress while driving is very common, especially when stuck in traffic or cut off by an erratic driver. When in this type of distress, simply take a deep breath in, hold it for a count of 2, and then quickly blow it out as if you were releasing a huge sigh of relief. Only try this 2-3 breaths otherwise you might hyperventilate, which is not what you want. This is a shortcut to finding calm quickly. So next time you’re feeling stressed, take a breath. Relax. You’ve got this. How Would it Feel to Discover Your True Potential? In life, the only constant is change. We all experience changes in needs, expectations, relationships, careers, money, time demands, and more. How do you effectively manage change? Do you simply survive or do you thrive in the face of change? Change affects us everywhere and in everything we do. With all the volatility in the world today, the security we seek in our lives is no longer a guarantee. Whether you’d like to protect your relationships, financial status, employment or family; you’ve worked hard for what you’ve achieved today. Don’t you feel like you deserve to know that your efforts won’t be wasted? How would it feel to thrive in our ever-changing world, protect all you’ve worked for, and become an ideal leader of your own life? To assist you in Discovering Choice, Living Purposefully and Being Well, we offer the Energy Leadership Index™. This system will help you bring your full potential to life! Barbara B. Appelbaum is a Certified Energy Leadership Index – Master Practitioner.